Derailed box cars are seen in the aftermath of Hurricane Michael in Panama City, Fla., Oct. 10, 2018. Hurricane Michael has weakened to a Category 1 storm, but is still a dangerous rainmaker as it travels across Georgia. 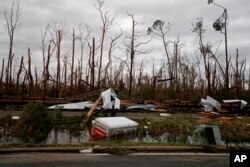 Michael slammed into the Florida Panhandle Wednesday as the most powerful storm to strike the U.S. mainland in 50 years. “We are catching some hell” was how a Panama City Beach resident who decided to ride it out described Michael as it made landfall. Shredded trees, derailed train cars and a sunken trailer are seen in the aftermath of Hurricane Michael in Panama City, Fla., Oct. 10, 2018. Michael came ashore with winds just under a Category 5 storm. Its 249 kph (155 mph) winds blew sheets of rain sideways. Trees and wires are down throughout Florida Gulf Coast towns. Many buildings have no roofs. Reporters on the ground said they could hear electric transformers exploding. 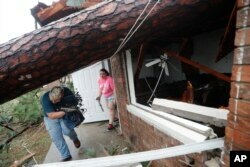 One storm-related death has been confirmed. A man was killed by a falling tree in Tallahassee. President Donald Trump has been in touch with state governors and said a federal emergency team is standing by and ready to help with storm recovery. He said he plans to visit storm-ravaged areas as soon as he can. Michael was the strongest hurricane to hit the Florida Panhandle in the area’s recorded history, after causing destruction in western Cuba and parts of Central America. At least 13 storm-related deaths have been reported in El Salvador, Honduras and Nicaragua. The National Hurricane Center predicts Michael will stay a powerful and dangerous rainmaker as it moves across the U.S. Southeast and off the Mid-Atlantic coast before heading out to sea by Friday. The end of the hurricane season is Nov. 30.